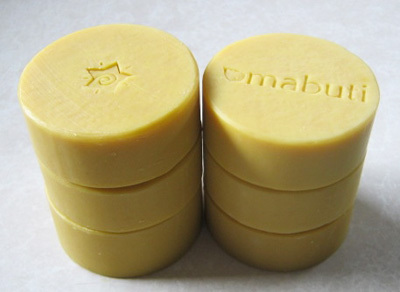 Here’s an efficient way to make large batches of round soaps. I posted several years ago about how I use poly tubing to create my shampoo bars. Denise Casperson in British Columbia, Canada took my idea a step further and I’m delighted that she wants to share her methods. 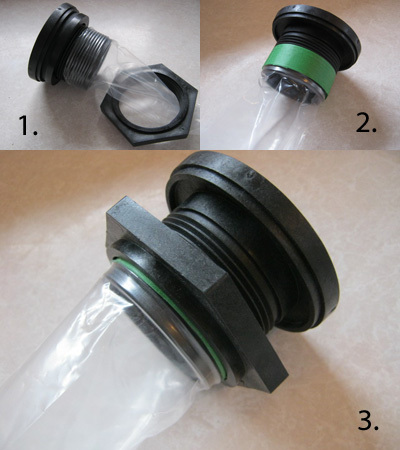 Benefits of Denise’s set-up: 1. pour at waist level to reduce air bubbles, 2. insulated to help force gel stage, 3. soap is protected and contained in case of a poly tubing mishap – which I admit I’ve had a couple!, 4. creates a smooth top = less waste. 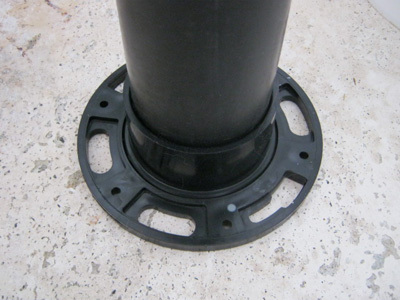 Removable flange on bottom of pipe provides stability. 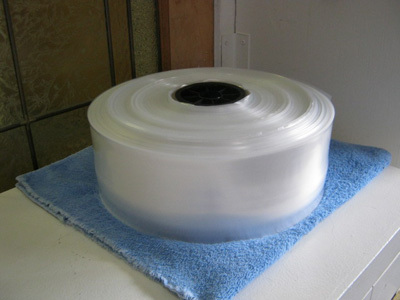 4 inch flat poly tubing produces a 2.5 inch round of soap. ABS bulkhead plumbing fitting; body with a 2.5 inch thread and a nut. 1. Once the poly has been cut to length, a knot or two is tied at one end, with the other end ready to attach to the fitting. 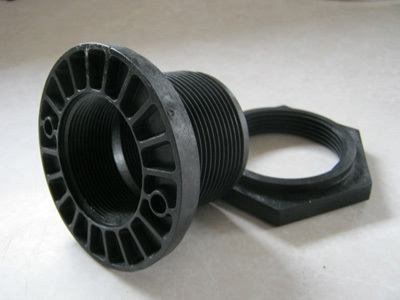 As the threaded part of the fitting is same size as the poly, the poly is gently stretched and then pulled up over the threads. Ensure the poly hangs from the fitting in a straight manner. 2. The threads are quite coarse, so I put a layer of masking tape over the poly to protect the poly and to provide a tighter fit when the nut is screwed onto the body of the fitting (3). 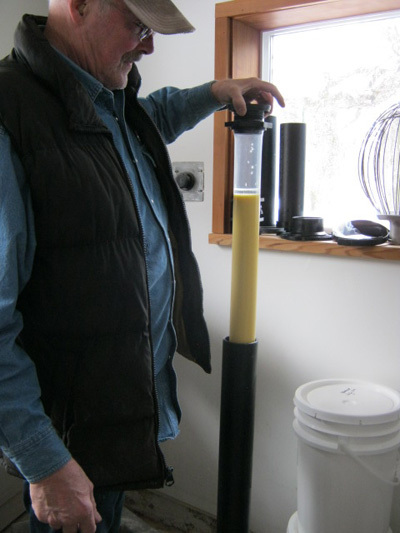 Once the length of tubing has been attached to the fitting, the tubing can be lowered into the 3 inch pipe, with the bulkhead fitting sitting on the rim of the pipe. It is now ready for filling. Once filled, the poly/fitting assembly is secure enough to lift/raise to check the progress of the soap. 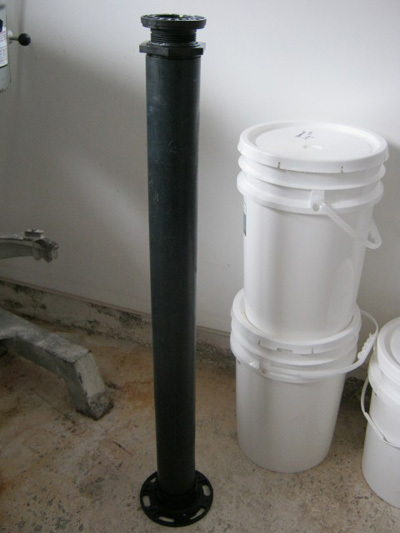 With the 2.5 inch soap round inside of the 3 inch pipe, the poly mold can hang unobstructed, the soap is protected, insulated, and contained in case of a poly mishap. 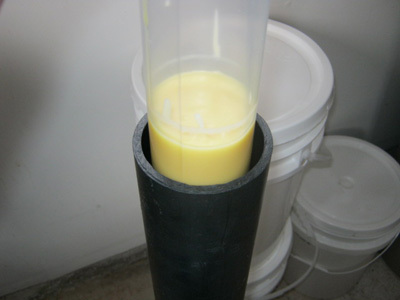 Soap has gelled, hardened and is removed from the mold. 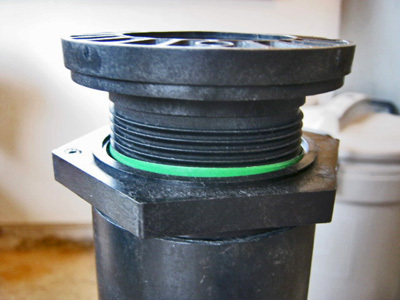 As the fitting holds the poly open 2.5 inches all the way to the top of the ‘mold’, there is only minimal loss/trim at the bottom where it has been knotted. Thank you, Denise, for sharing this wonderful tutorial with us! Wow! very interesting! Thanks for sharing!! Thanks for sharing and all the pictures. How did you add the stamps afterwards? 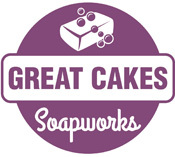 @Chris – While this isn’t my tutorial, I have stamped soaps before, so I know how it’s done. You can order stamps that are specifically for soaps and then just tap the impression in the soap with a rubber mallet once it’s set.